Tattoos are considered an expression of self on your body. 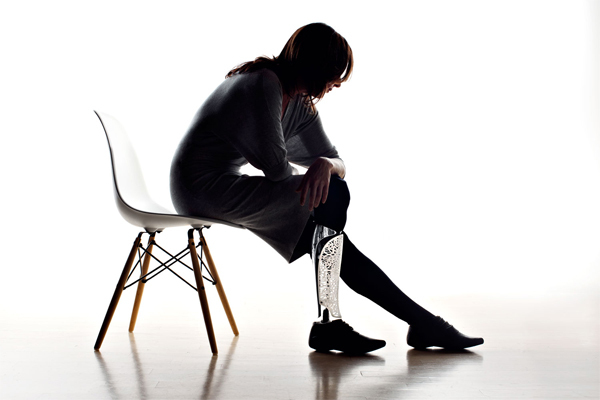 Today there are prosthetic designers who apply the same philosophy to prosthetic limbs. Having to use a prosthetic limb can instead of being a harrowing experience, be a beautiful expression of yourself. Each of our bodies is unique to us, just like our style and taste. When it comes to our body’s limbs, each size does not fit all. Hence, designing a prosthetic that is unique to you not just in fit but also in style and taste is important. It allows the wearer to connect more to the prosthetic limb and become more confident when wearing it. Well fit prosthetic limbs, costs quite a penny, and wear & tear means it needs to be changed every three to four years. Given the amount of money spend on it, and how necessary it is to the wearer, it may as well display the personality of the person. Prosthetics can be personalised with a number of different options. By collaborating with laser designers, wood and plastic artists, with a combination of different colours and textures can provide you with a number of different unique looks. These are built with materials which are water resistant, light weight and durable. You can choose what extensions you want to build for e.g. pockets (kids). You can create custom 3D-printed covers called fairings for existing prosthetics. These fairings are made by making a base with a 3D scan. The working limb is first scanned to replicate the shape, after which the existing prosthetic is scanned. The prosthetic wearer can then select their own pattern, materials and finish to personalise it. Using a 3D printing process the prosthetic is then completed. It allows you to match your outfit with your prosthetic. Losing a limb is a traumatic experience. To have to then adjust to a prosthetic can make the wearer very conscious of their self and lose confidence. By being able to customise your prosthetic and giving it a personal style statement, allows the user to connect more to it. Instead of being a foreign object being attached to you, it becomes an extension / accessory that to the user making a statement about them. As many users of prosthetics say that wearing a prosthetic draws attention every time which makes them uncomfortable. With the designer prosthetics, this attention can be changed into something positive. These new brand of prosthetics aren’t just pretty, they are also now being designed to perform some alternate functions. If you remember the movie Edward Scissor arms, well a prosthetic version of that! Arms which have a Swiss army knife with tools that fold out, or legs that have night club lights, or just cooking arms with attachments that help you cook. These are all some really awesome futuristic designs that are being designed. Naturally these personalised prosthetics, be it just a cover or a brand new prosthetic will provoke a reaction in the viewer. However, this is a more positive reaction for the users and helps them to be more comfortable with the prosthetic than before. This article is penned by Harry Cooper, a popular health and wellness blogger. He works for a leading orthotics stores located around Indianapolis, IN. He gives excellent health tips and advice through his articles.